Apple's newest and cheapest handset takes on the Galaxy Note 9, Pixel 3 XL, and OnePlus 6T. The new iPhone XR might not be a flagship, but it’s really good. So good, in fact, that I called it Apple’s best iPhone ever in my review—not because of its specs (which are technically inferior to those of the XS and XS Max) but because of its value proposition. That’s pitting it against other, pricier iPhones, though. 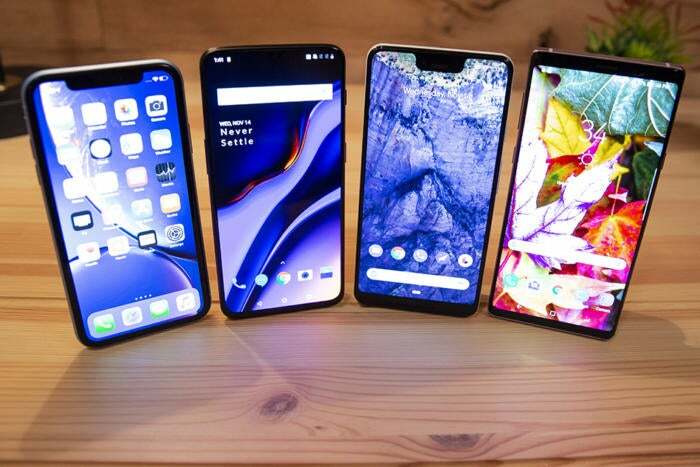 I wanted to see how the iPhone XR would fare against three of Android’s best phones: the Galaxy Note 9, Pixel 3 XL, and OnePlus 6T. We’ll walk through all the major factors we review in a phone, discussing each phone’s pros and cons and picking a winner. Click a link on our table of contents if you want to jump to a specific item. Ask any screen geek about the difference between the iPhone XR’s LCD display and an AMOLED screen, and they’ll tell that there’s no comparison. Text is crisper, colors are brighter, and whites are more brilliant on the OLED displays, and blacks are as deep as they can get thanks to the ability to turn off each individual pixel completely. LCDs have their strengths—they’re much cheaper to manufacture, and brighter and easier to read in sunlight— but they’re inherently inferior to OLED due to the need for constant backlighting. That makes them thicker, less malleable, and less power-efficient, with duller colors. The screens are all great, but the Note 9’s (far right) handles color and detail just a bit better than the Pixel 3 XL (second from right) and OnePlus 6T (second from left) do. Even the iPhone XR’s 720p screen (far left) looks good. All of the screens here are very similar, but somehow the 6.2-inch iPhone XR looks tiny compared to the 6.3-inch Pixel 3XL, and 6.4-inch OnePlus 6T and Galaxy Note 9. In addition to its size, the display in the iPhone XR’s resolution is 1,792x828, or 720p, versus the 2K displays on the Note 9 and Pixel 3 XL, and the 1080p one on the OnePlus 6T. The XR’s effective ppi is just 326, again a far cry from the Note 9 (516), Pixel 3 XL (523), and OnePlus 6T (402). However, unless the phones’ screens are compared side by side, most people aren’t going to see a difference. It’s tough unless you know what you’re looking for. Scaled-down HD content still looks great, text is crisp and easy to read, and even blacks looks good. True Tone is an absolute delight. Apple calls the screen on the XR “Liquid Retina,” a fancy marketing term to draw attention to the rounded corners and “all-screen design.” But I also found it extremely color-accurate, and I preferred the shape of the XR’s corners to those of all the comparison phones. The Note 9’s are a bit too boxy for my tastes, and the OnePlus 6T’s too round. The Pixel 3 XL is the worst of the bunch, with mismatched top and bottom corners that offend my eyes. The iPhone XR excels in brightness, too. In my testing, which turned each phone to maximum brightness and turned off the respective adaptive brightness toggles (as well as True Tone on the XR), the iPhone XR topped off at 825 nits, with the others coming in below 700. The Note 9’s 2K OLED sceen is superior to the iPhone XR’s LCD, but not as much as you’d think. However, there’s no hiding that the iPhone XR has an LCD. No matter how much work Apple put into making the XR screen realistic and vibrant, a pixel-by-pixel comparison with the three OLED-equipped phones I chose wasn’t much of a contest. The OLEDs accomplish a broader range of tones and hues, most clearly when viewing something with a black background, like Apple’s iPhone XR page. On the OLEDs, the blackness blends into the bezels, but on the XR there’s an obvious distinction where the screen ends and the bezels begin. Out of the three OLED phones, I prefer the Note 9. Samsung makes the best OLED displays in the business—in fact, it supplies screens for the iPhone XS and Pixel 3 XL. The optimization and calibration it’s done on the Note 9 is second to none. Samsung also offers a variety of display options to adjust both the resolution and the temperature. The Pixel 3 XL is a close second—though I noticed a bit of smearing when watching videos. The OnePlus 6T does well with fewer pixels, particularly after I switched to DCI-P3 mode. In fact, I found the default setting way too saturated for all of the Android displays, a problem I didn’t have with the iPhone XR. Which is good, because even if I did I couldn’t do anything about it. While you can tweak the color settings to your eyes’ content on the Galaxy Note 9 (left), you’re only able to adjust the brightness and toggle True Tone on the iPhone XR. 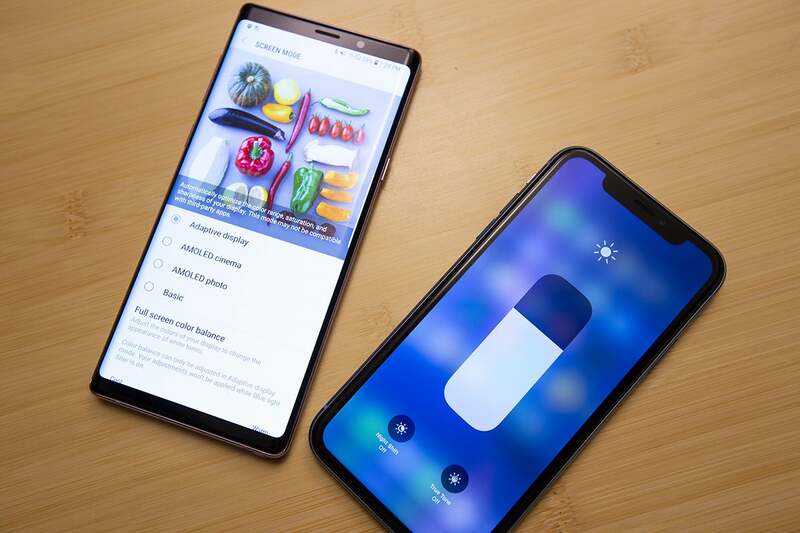 Even with the screen mode set to “Basic,” the Note 9 shines, with richly saturated colors, excellent white balance, and barely any visible banding. Though its maximum manual brightness is lower than that of all the other phones, it still lights up a room and performs extremely well in direct sunlight. I preferred the aspect ratio of the XR and other Android phones here to the Note 9’s ultra-tall proportions, but ultimately I just couldn’t deny the overall greatness of Samsung’s display. When I compared the iPhone X vs. flagship Android phones last year, I predicted that “a couple of” Android flagships would adopt camera notches in 2018. It turns out nearly every major Android phone maker sells a phone with a camera notch. Even holdout Samsung teased a family of notched screens at its developers conference. The bezels are much thicker on the iPhone XR (left), but the tiny notch on the OnePlus 6T really brings it home. But a notch alone does not make a premium phone. The iPhone XR has the same cutout at the top of the screen as the iPhone XS, but the designs diverge otherwise. On the XR, the glass back comes in four new colors in addition to the standard white and black, and the sides are made of color-matched anodized aluminum. That’s a material downgrade from the iPhone XS’s stainless steel, but I actually prefer it. It’s less prone to scuffs and scratches, but I especially like the way the color peeks over the edges of the screen. Simply put, the rear of the iPhone XR is a thing of beauty, even more so than the Pixel 3 XL’s gorgeous two-tone frosted glass. And it’s a small thing, but I like the placement and length of the iPhone’s power button. The bezels, on the other hand, are less beautiful. Due to the inherent engineering issues with LCD screens, Apple has increased the size of the bezels on the XR by about 50 percent compared to those on the iPhone X (4mm vs 2.5mm). The difference is stark. For years, Apple has taught us that every millimeter matters when it comes to smartphone design, so the iPhone XR feels like a step backward from both the iPhone X and 8. Apple could have given the iPhone XR slimmer bezels with a larger chin and forehead like the other phones here. By sticking with 4mm bezels all around, the company prioritized symmetry over slimness. 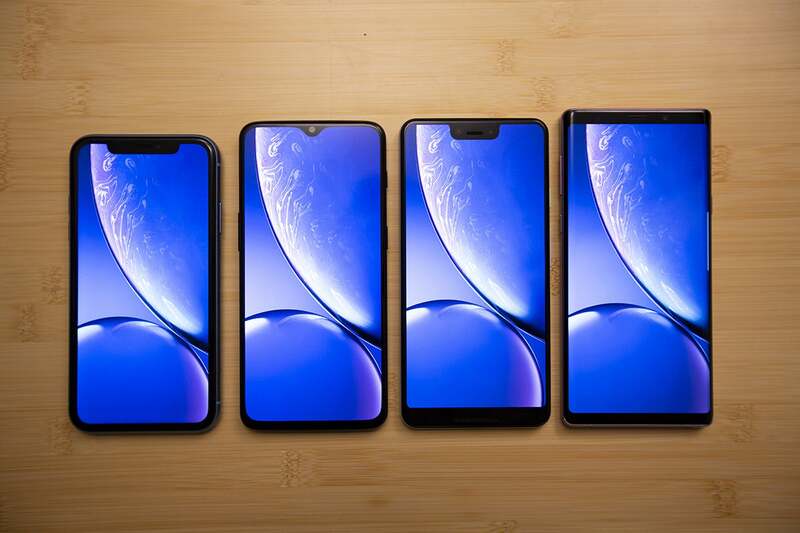 I actually prefer the iPhone XR’s display design to the the Note 9’s unbalanced Infinity Display and the Pixel 3 XL’s giant chin. However, when it came to watching movies, the XR’s notch was a real issue, while the 6T and even the Pixel 3 XL were able to hide it. 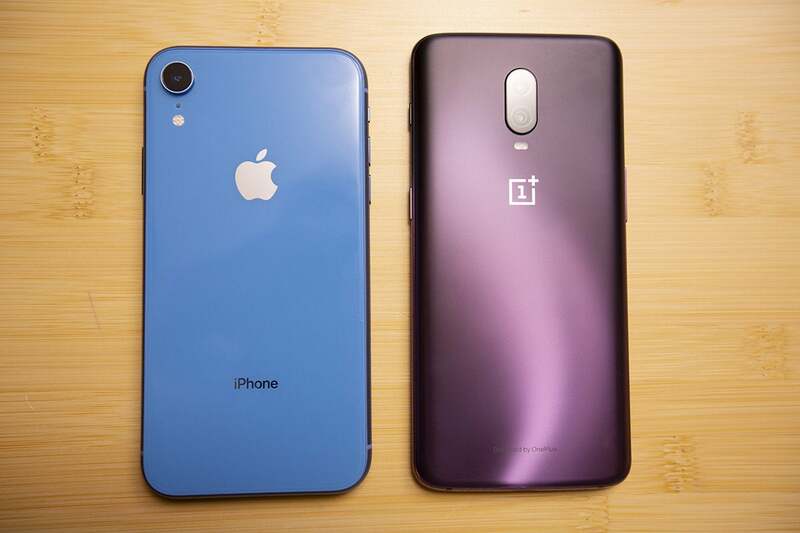 There’s no denying the awesomeness of the OnePlus 6T in Thunder Purple (right). The OnePlus 6T gets it right. Yes, the chin is larger than the side bezels, but it’s nowhere near as large as it is on the Pixel 3 XL or the Note 9. In fact, it’s no bigger than the XR’s bottom bezel, with slimmer sides and a skinny forehead that’s interrupted only by the smallest of notches. The OnePlus 6T has a “teardrop” notch just large enough to include a single camera, unlike the wide notch on the iPhone XR and the ultra-deep one on the Pixel 3 XL. Like those phones, the notch extends a bit deeper than the standard status bar, but its curved design has a slimming effect. It’s done so well, I prefer the visible notch to the blackout bar, and it’s one of the few phones I’ve used where it actually feels like I’m getting more screen real estate and not just a weird compromise. I never thought I’d see the day when OnePlus bested Samsung or Apple with a smartphone design, but the 6T is a real work of art, with the highest screen-to-body ratio of all the phones here and a notch that even haters can love. And just wait until you see the new Thunder Purple color in person. When Apple announced the XR alongside the XS and XS Max, the most surprising difference between the three devices wasn’t the screen, it was the battery life. According to Apple’s specs, the iPhone XR “lasts up to 1.5 hours longer than iPhone 8 Plus,” which is more significant than it seems. The iPhone 8 Plus was Apple’s previous battery champ, lasting noticeably longer than the iPhone X. 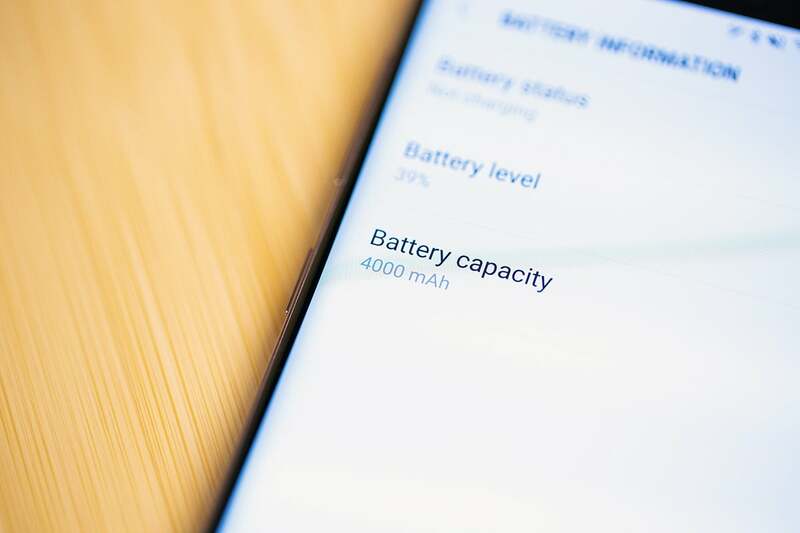 The Galaxy Note 9’s battery capacity trounces the iPhone XR’s. On paper, the iPhone XR gets smoked, plain and simple. But as usual with the iPhone, paper doesn’t tell the whole story. 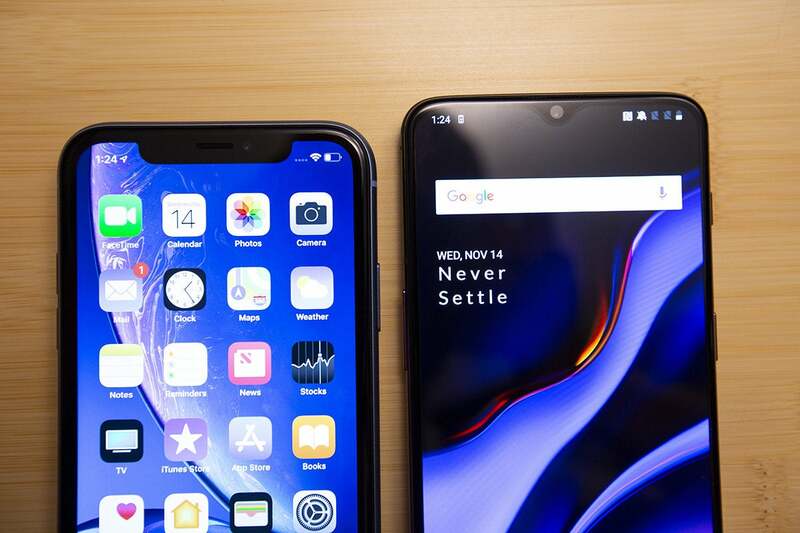 OnePlus and other Android phone makers have been known to game benchmarks to skew results in their favor, so we should take these numbers with a grain of salt. And as such, real-world testing didn’t bear out these results at all. 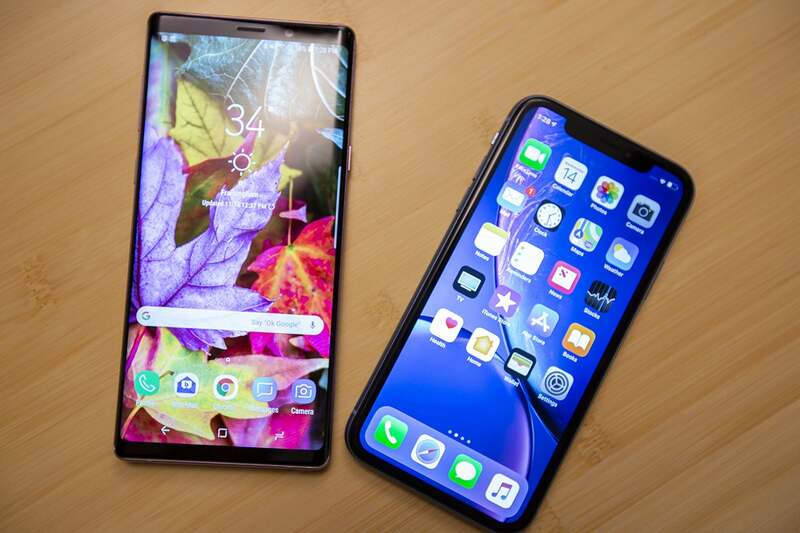 The two best performers in day-to-day use were the iPhone XR and Note 9, which scored the lowest using Geekbench’s test. Apple has a knack for squeezing lots of juice out of relatively small batteries, and the XR is no exception. iOS 12’s Auto-Brightness is either vastly superior to Android Pie’s Adaptive brightness, or Apple is performing some wizardry with background processes. Each of these phones lasted through a full day of heavy use (or close to it), but the iPhone XR was the one phone that consistently ended the day with a decent amount of battery to spare (10-20 percent), without ever needing to plug it in. The Note 9 was a close second. The OnePlus 6T performed extremely well too, though it tended to get extremely dark with automatic brightness turned on, to the point where some movies were unwatchable. 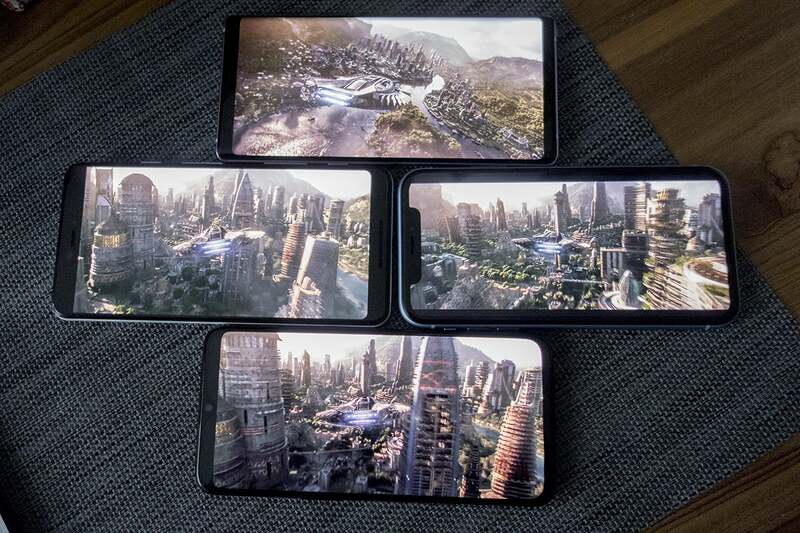 Streaming an HD movie at full brightness looked great on all four phones, but the XR’s notch really gets in the way. It’s here where you can see how the iPhone XR’s adaptive brightness and the A12 chip benefits the battery. Where the other phones took a 20-percent hit and got quite warm after a third hour of streaming, the iPhone lost just seven percent of its battery life and barely broke a sweat. Whatever Apple’s doing with its phones is incredibly impressive. I can only imaginee how long the next iPhone would last if Apple decided to give it a 4,000mAh battery. When the battery's died, who charges fastest? Find out on the next page.